It’s a horrible feeling. That sudden moment when your stomach turns over with the thought that you’re not going to make the corner which sends you down the path of being over cautious, making mistakes, or possibly falling into full-blown panic. The thing is, for most riders going through that experience they will very often get into the corner and have the feeling that they are now going too slow. 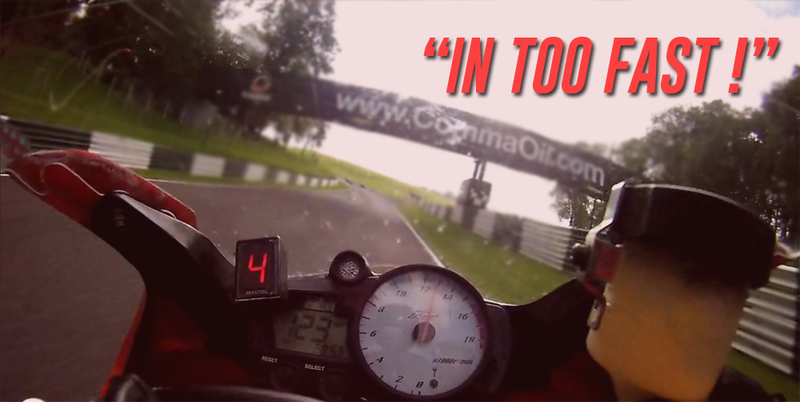 This “in too fast” feeling is something that can be a stumbling block for many learning riders as they work to use more of the bike’s potential and climb the track riding ranks. In this article I wanted to go over the most common reasons behind this feeling to hopefully help you get to the bottom of what’s creating this block for you, as well as offer some practical advice to eventually overcome it. As I have spoken about many times now there is a certain way in which we want to structure our braking effort on the approach to a corner. A common mistake among less experienced riders is to begin braking lightly, but as they get closer to the corner and realise they’re going too fast they ramp up the pressure on the brake lever the closer they get to their entry point. The feeling of going in too fast presents itself because they are in fact approaching the corner with too much speed, so they ramp up the braking pressure to set a more ideal speed for their current ability. This means they’re operating more in a state of panic rather than in a confident and controlled way. This creates a number of issues and negatively affects their corner entry speed. Quite simply, by turning this approach on it’s head and getting the bulk of your braking done earlier in the braking zone. By becoming confident with using hard brakes and getting the hard braking done early, you’re putting yourself in a much better position to judge entry speed as you taper the brakes off on your approach to the corner. Lean angle barriers are something that the vast majority of learning riders will come up against on their quest for more speed around the track, and because of this most of those same riders will be held back from higher corner entry speeds. They’ll certainly have good intentions of running higher speeds into the corners and leaning the bike more, but when they come back around to that same corner again and attempt that higher entry speed, they’ll be hit with the feeling that they’re going too fast because subconsciously their lean barrier is still there, so they slow down to a speed they know is safe. While tough to crack, lean angle barriers are not uncrackable. In my personal riding experience as well as seeing many many learning riders make the same breakthrough, my advice is to gain as much perspective as possible on just what your bike and tyre combination is capable of, then simply put yourself in a good position (both physically and mentally) to incrementally push your boundaries. This is a big one. If your vision isn’t working correctly at corner approach and entry, you’re very likely going create bigger feelings of heading into the corner with too much speed than if they are working correctly. Not looking far enough ahead is a common culprit of bringing on the panic of too much speed because everything feels like it’s happening at very short notice and your ability to properly judge your corner entry space and speed is impaired. If you cannot correctly see and judge the space you really have to play with, you’re always going to be limited on just what you can do with that space. Quite simply to learn and apply correct vision technique so that you can better see the space you have, but also to give yourself more mental time to process what you see and judge the space you have to play with. Speed of steering is a big key to unlocking speed in many areas of the track. Some sections of track will almost entirely be limited by how fast you can change direction. If you don’t feel you can steer the bike any quicker (or it’s not in your plan to try) and you add more speed to that equation, the fear of going in too fast and running out of space is very much going to be there to hold you back from making that next step. Learning how you control the bike and then practising getting comfortable with a faster speed of steering should be your first step here. You won’t need lightening quick steering actions in every cornering situation, but a faster speed of steering is going to benefit you in a lot of places. I hope that all of this is showing you that the feeling of going into corners too fast is only a surface level issue, and in most cases you should be able to link it to one or a number of the above. Also, in most cases this feeling will come from your perception of the space you have and how effectively you can use it. If you already feel that space is limited (based on what you see and your ability with the bike) then adding more speed to that equation is always going to have those panic lights flashing because you don’t believe you’ll make it through the corner safely with more speed. In truth, all less experienced riders will be able to make improvements to all of the above, and while you won’t eradicate it completely as you work to push your boundaries, it is making these improvements that is going to put you in greater control of the space you have and mean the feeling becomes less frequent and less severe. This is then going to help you make better steps forward. Typically it’s only once you get to the other end of the scale and you’re really pushing on at a really fast pace that “in too fast” really means in too fast. Before that point it will be some part of your riding ability that’s creating this false perception more often than not. Working in these key areas is what’s going help move that perception to a place that lets you make that next step.